Soup is a love language of mine. I remember my mom making us warm bowls of soup in the winter to warm us up or to heal us from a cold. Somehow it always made me feel instantly better and so I wanted a way to share that love. 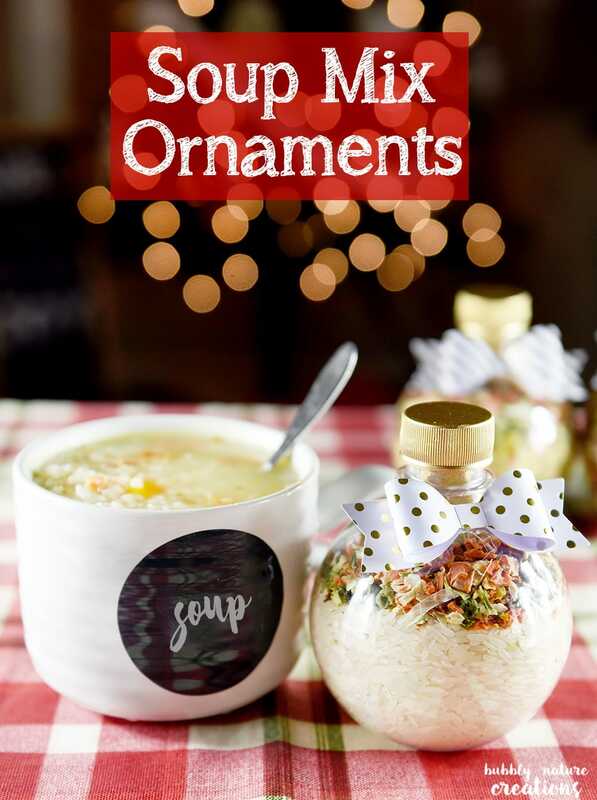 Soup Mix Ornaments are perfect Holiday gift idea to give to friends and family! 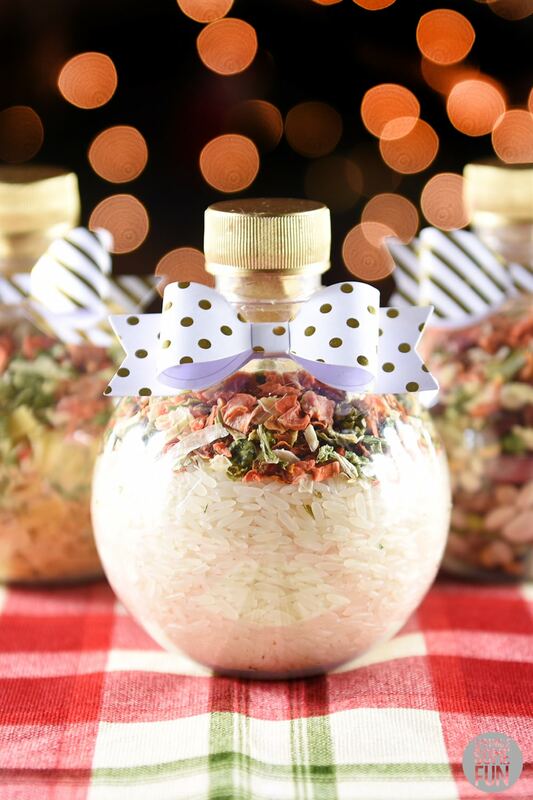 These are great to make for co-workers, teachers gifts and secret santa gifts as well. This Soup Mix Ornaments post has affiliate links. I can’t think of many things more warm and comforting than a bowl of hot soup on a cold day. Ornament gifts have become a tradition in my family for the last 3 years since making the Hot Cocoa Ornaments I shared in 2013. Everyone loves them and they can’t wait to see what I will give them each year. I try to keep in mind the season we are in and make sure the recipes are warm and comforting. Plus, I know that most everyone loves a gift that they can eat too! This recipe makes a batch of soup that will feed a family of 4 and makes a little more than (5) 1 cup servings! 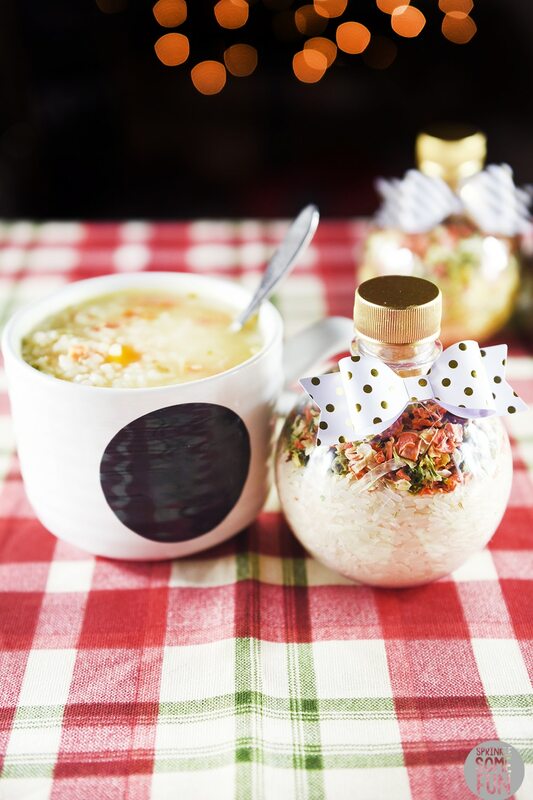 Everything that you need to make the soup except the water is stored in the “ornament” shaped bottle until you need to make it. I’ve suggested some add ins below in the recipe like canned chicken, but it’s not necessary. The soup tastes great on it’s own! The veggies in it are to add flavor and so think of them more as a “spice” rather than actual vegetables. The only ingredients you may not be able to find at your local supermarket are the dried veggies and the Amish noodles. I’ve included links to Amazon for everything that I could find online and so hopefully you won’t have any problem finding those ingredients. 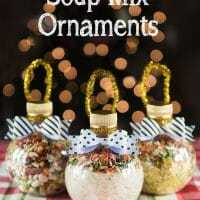 I made 3 different mix recipes for these Soup Mix Ornaments. Mixed Bean Soup, Chicken and Rice Soup Mix, and Chicken Noodle Soup Mix. Just be sure to print off the recipes and include them when you gift them to friends and family. Harmony House Dehydrated Vegetable Soup (affiliate) note* do not use the seasoning packet. Discard or use for something else. Aqua Balls NO LONGER AVAILABLE Alternative are these 8.5 oz. glass bottles (affiliate) They have cork lids, but should keep the contents inside nicely. I also found some 10 oz. jars at Hobby Lobby which you can find for $1-$3 each. I am not sure how much more these containers hold, but just be sure to measure it out so you can accurately adjust the recipe. The assembly of the ornaments is so easy! I used a large funnel to put the ingredients inside the washed and dried aqua balls. Since aqua balls are no longer round like balls… you’ll need the glass jars which should not need to be cleaned out. The bouillon cubes can be crushed before placing inside also. I painted the caps gold with the spray paint and added pipe cleaner hangers by wrapping them around the bottom of the caps and making a loop (this is optional because really these are not practical for actual hanging). I then super glued the bows on for the finishing touch! So fun! I think they turned out super cute and would be perfect gifts for anyone on your list. Especially co-workers, secret santa, or anyone that would enjoy a warm bowl of soup for the holidays! Please note that these ornaments are not meant to be placed on the tree. They are meant to be a cute gift that resembles an ornament. 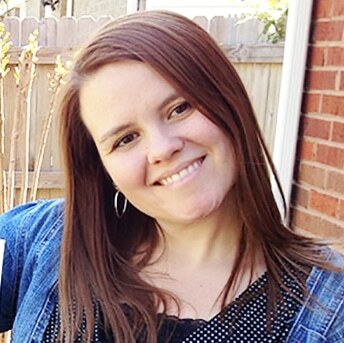 Follow me on social media or sign up for emails, so you never miss a post! 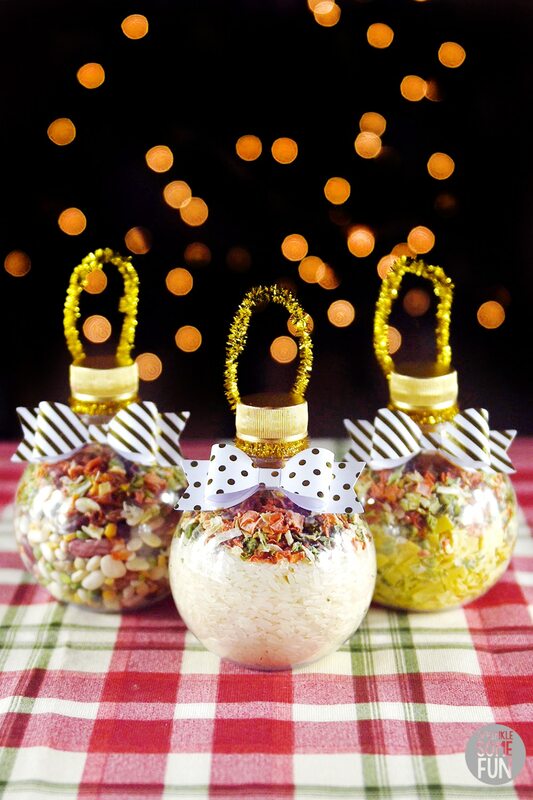 If you LOVE this Soup Mix Ornament Gift Idea, be sure to share it on Instagram and tag me #sprinklesomefun so I can see it! This is a unique edible gift idea for anyone on your Christmas list! 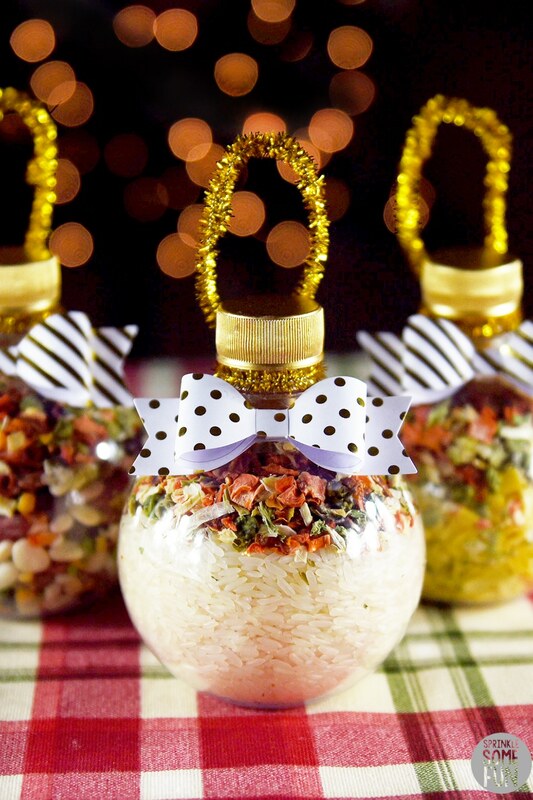 These soup mix ornaments are so cute and everyone will love them. The "ornament" containers are aqua balls, but they are no longer available. SEE OPTIONS BELOW! For each recipe just fill the ornaments with the dry mix starting with the main ingredient first. Place contents of ornaments and 5 1/2 cups water to a large pot. Let it all come to a boil and then turn down to medium low heat. Cook for 2 to 3 hours or until beans are tender. You may need to add more water as it cooks to make a more soupy consistency. Place contents of ornaments, 5 1/2 cups water and canned chicken (if using) into a large pot. Let it all come to a boil and then turn down to medium low heat. Cook for 20 to 30 minutes or until rice is tender. You may need to add more water as it cooks to make a more soupy consistency. Place contents of ornaments, 5 1/2 cups water and canned chicken (if using) into a large pot. Let it all come to a boil and then turn down to medium low heat. Cook for 15 minutes or until noodles are tender. You may need to add more water as it cooks to make a more soupy consistency. I used Aqua balls for the original container, but they have changed shape since I posted this. I have found an alternative, but it's made of glass. It's important to note that these should not be hung on a tree. They will be too heavy for that and with glass this is especially important. For the alternative; I suggest Round Glass Bottles with the Cork lids. If you can find the kind with a screw on lid or the original aqua balls they will hold up better, but the cork should work just find. These Round Glass Bottles (affiliate) should work great. They are only 8.5 oz, though. The original recipe was made for the 12 oz. aqua balls size. I've reduced each recipe to 7/10 of the original recipe because of this. To convert the recipe back to the original (if you are able to grab some older aqua balls then you'll need to increase each ingredient by 30%. Where can you find “food safe” ornaments to use? Are they glass or plastic? on the soup ornament, there is no way the recipe fits in the ornament. 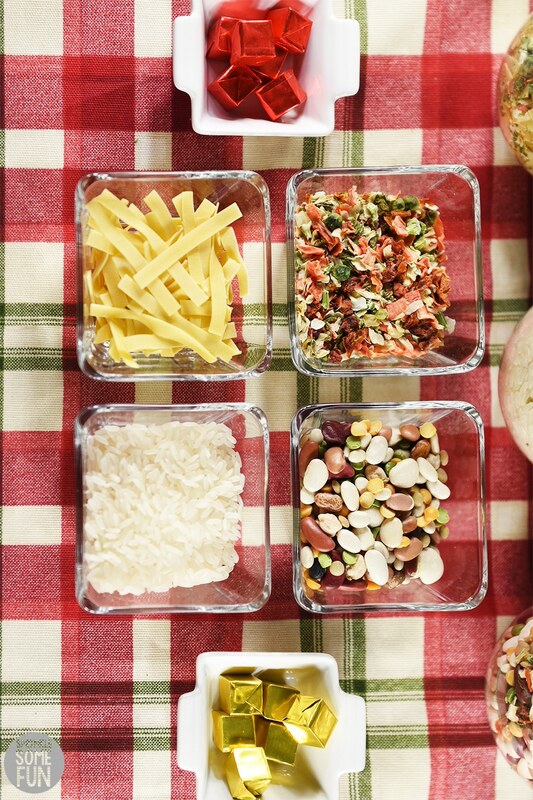 Did you divide it into portions like for individual servings’ which would be how much? I used aquaballs and the ingredients I used do fit into those specific containers. I am curious about the amount of water needed for the soup mix ornaments, are they individual servings? 4 ounces? 8 ounces? Also the hot cocoa mix, individual servings? How many ounces of milk? 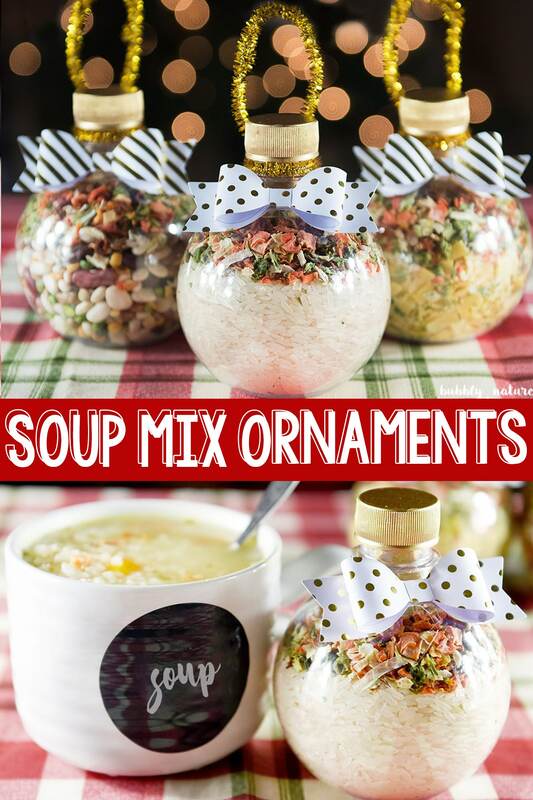 I would love to make and sell these soup ornaments at craft fairs (I do have a food servers license) but the cost of the glass ornaments would make it too expensive. 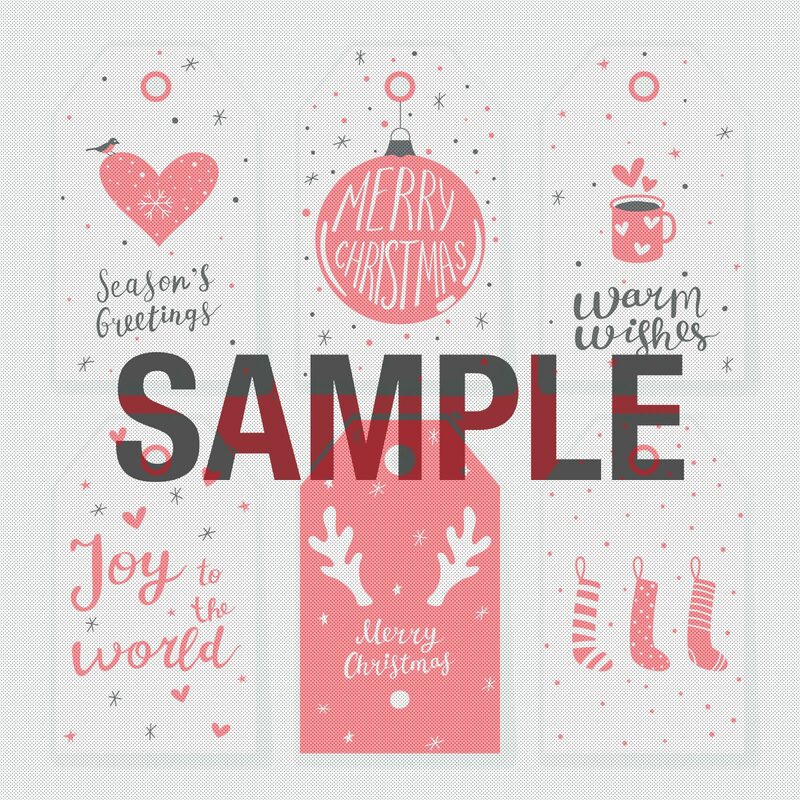 Would the plastic ornaments from Hobby Lobby or other craft stores be ok? sealing cork. Hope this helps. thanks for the suggestion, Janice! Super disappointed in the Harmony vegetable soup (the dehydrated veggies.) They completely disappear when you cook the soup.